The sequence of damaging events occurring following irradiation. 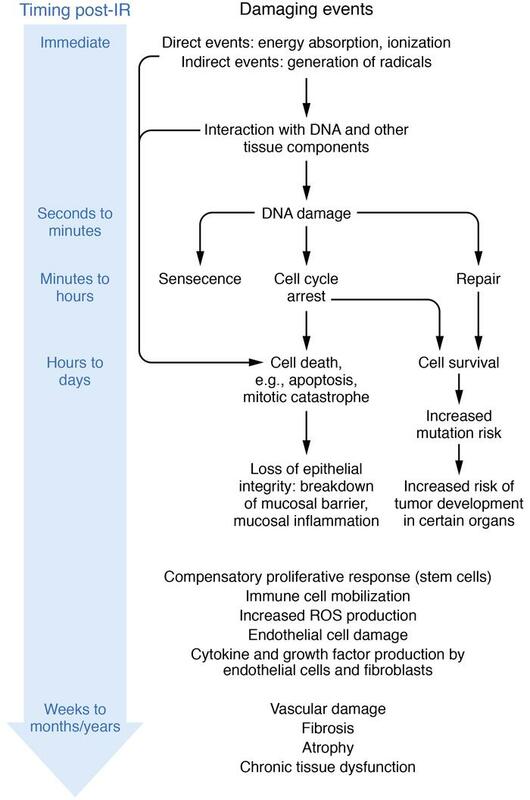 Damaging effects of irradiation on various cellular compartments can occur within 10–17–10–13 seconds to months or years after irradiation, resulting in a variety of acute or chronic effects. A selection of these damaging effects and their consequences is shown to the right-hand side of the timeline. While the sequence of early events (within hours of irradiation) has been studied in detail, the timing of and relationships between events occurring weeks to months or years after irradiation are more complicated and are still incompletely understood. This complexity is reflected by a lack of arrows between events. Figure adapted from ref. 21.